We’re excited to be launching our ‘Workshop on Wheels’ – making DIY and craft activities accessible to people in a wide range of community venues and neighbourhoods around Hastings and Rother. The large WoW van has been customised with workbenches and tool cupboards so that our skilled tutors can take the workshop to visit groups of people and provide practical activities such as repairing furniture, making items from scrap wood and craft projects. Having run workshops and courses at our stores in Hastings and Bexhill for many years, we are excited to have found a way to take some of these activities out into the community so that more people can enjoy taking part without the difficulty or expense of travelling to us. The positive impact of making activities on health and wellbeing is well documented, and we hope that the small neighbourhood groups will be a great way for people to meet up with their neighbours as well as getting to know new people in their area. Our in-store workshops have taught us that, for many people, making or repairing something for their home is a deeply meaningful activity that increases their confidence and gives them a more positive outlook on life. The WoW project has been supported by the Hastings and Rother CCG (Clinical Commissioning Group), allowing the workshop sessions to be offered totally free of charge to local residents. 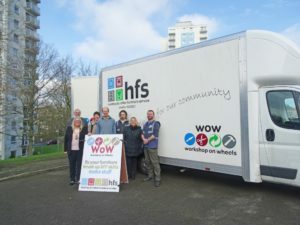 The interior of the WoW van has been kitted out with funds raised by HFS patron Mark Thomas at a pre-gig talk at St Mary’s in the Castle in November last year. The workshops will run every Friday at 10am and 1.30pm respectively for four weeks starting from February 10th. Future venues and dates will be added to our workshop calendar throughout the year so watch out for WoW popping up somewhere near you! To take part, just come and say hello to our team with the WoW van at your nearest location.